The Product Library allows you to browse the Carefree products to quickly locate information such as owners manuals, operation guides and more. Just select your product on the left to quickly access this information. Raise your camper top in less than a minute. Raise your camper top in less than minute! The only room on the market that works with your 12 volt steep pitch Travel'r or Eclipse! The Add-A-Room LTD turns your awning into a spacious private room. Roll the privacy panels up for fresh air, roll them down for complete privacy. Great for relaxing, dining or extra storage. Apline is the newest innovative slide awning addition to the Carefree line. Lightweight design in a high quality room for all brands of traditional and Carefree 12v awnings. A sleek and strong lateral arm awning. The Carefree of Colorado Apex Patio Awning offers the coach owner an awning system that provides as much or as little shade as required. The canopies are housed in an aluminum case that easily blends in with the coach roof. Ascent is a sleek innovative slide awning addition to the Carefree line. Ascent is the newest innovative slide awning addition to the Carefree line. 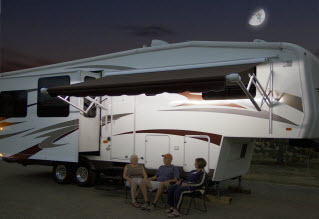 The Ascent is the newest innovative slide awning addition to the Carefree line, available on select motor homes only. Awning Hangers stay in the roller and roll up with the awning. Nothing to lose! Perfect for hanging plants and all kinds of decor. Fits in the utility slot of your awning roll bar. Easy to put on and take off. They can stay in the roll bar and roll up with our awning. 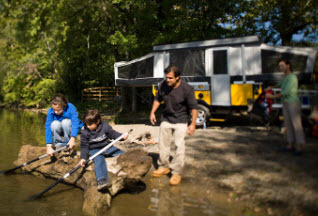 Enjoy the ultimate campsite: Clean, cozy, color coordinated and incredibly durable. Cool comfort at a super low price! The best value screen room on the market! Get the easiest to set up, most practical and best value screen room on the market. Use and enjoy your awning twice as much with the Breezeway Screen Room. Fits all brands of traditional and 12V awnings with vertical arms from 10'-21'. Fits Carefree Campout and Freedom awnings from 3-5 meters. The best bag awning for folding camping trailers. Keep your awning from flapping in the breeze. These durable clamps mount to your Carefree, A&E or Faulkner patio awning rafter arm and easily fold out when needed. Designed specifically for 12V awnings! 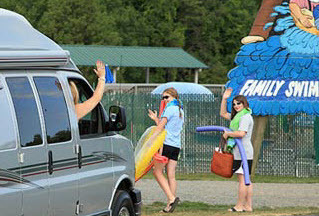 Shade the cargo area of your SURV from sun & rain when the door is open. Enjoy your privacy and the breeze and keep the bugs out while your ramp room door is open. Carefree's Door Shade blocks out unwanted light making the inside of your RV more pleasant. The industry's 1st 12V power awning that features instant pitch adjustments! 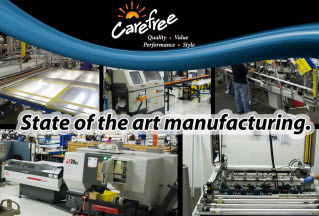 Carefree's Eclipse is the industry's 1st 12V power awning that features instant pitch adjustments! Buy a complete Eclipse or upgrade your existing Carefree or A&E roller assembly with a 12V Eclipse Arm Set! The industry's 1st 12V power awning that features instant pitch adjustments and a 9' Extension! A Premium Awning at a Great Price. More Exclusive Features than Competitive Awnings. The most beautiful, easy to operate box awning in the World! 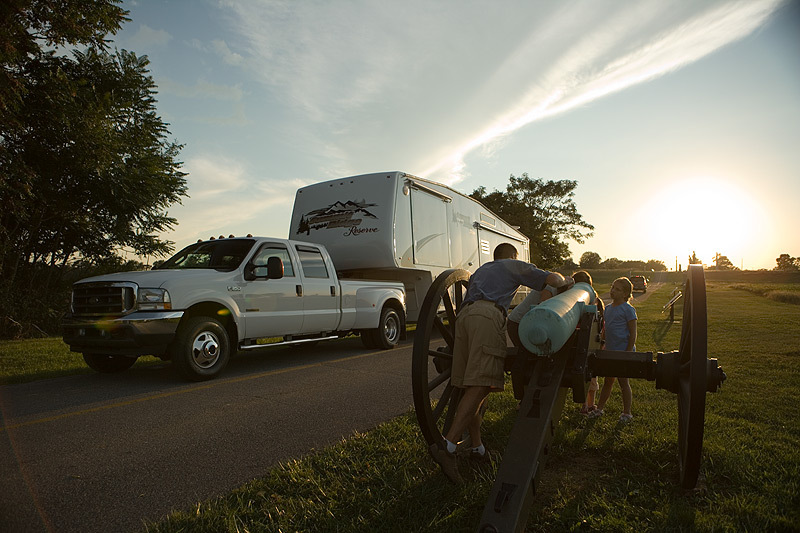 Carefree of Colorado Freedom Wall Mount Awning is a box awning that mounts to the side of your truck camper or RV. The next generation of RV awnings. Complement the sleek appearances of Carefree's Mirage, Eclipse, Travel'r, Summit & SL Window awnings! New boxed Over the Door and Window awning designed to complement the sleek appearances of Carefree's Mirage, Eclipse, Travel'r, Summit and SL Window awnings. Carefree of Colorado 110V Mirage with Direct Response Electronics includes easy to use controls and motion detection system prevents wind damage. Created for class A's with cab-forward entry and travel trailers with a driver's side door. 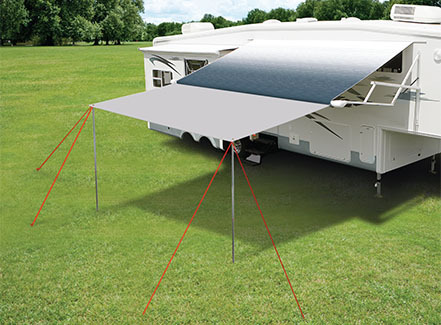 This smart new awning has three positions to protect your RV: Slideout, Slideout & Window, and Full Patio Extension. Buy as a complete awning or simply change out your existing hardware. Carefree Pioneer Lite Patio Awning - Buy as a complete awning or simply change out your existing hardware. If your RV patio awning's old, warn out springs are the only things that need replacing, save time and money by purchasing the Pioneer upgrade kit. Tighten your canopy for camping and support your roller for travel. A variety of universal fabric replacements fit most patio awnings. SOK III operates automatically with the slideout to help protect it from water, dirt, and debris when it is extended! The SideOut Kover III awning integrates with the patio and window awnings for a sleek, modern, unified look. The ideal solution for those large side windows. The Carefree Simplicity Plus is all you'll ever need if you don't mind giving up a few of the features you'll find on a premium awning like the Fiesta or Spirit FX. Carefree's Skylight Shade blocks out the light! Easy to use, spring loaded shades cover the entire vent or skylight to block out light. Housed in a White aluminum case to blend into the interior of your RV. Save on A/C and complement the sleek, finished look of your Eclipse or Travel'r Patio Awning. Carefree of Colorado SL Window Awning - Save on A/C and complement the sleek, finished look of your Eclipse or Travel'r Patio Awning. SL Window Awnings - Premium Vinyl Fabric - Autumn Sale! The new Slideout Cover is a no-frills slideout awning that automatically extends with the slideout room to provide shade and protection, without breaking the bank! The ideal solution for those large windshields. The Best Traditional Roll-up Awning You Can Buy! Carefree of Colorado Spirit FX Patio Awning, The Best Traditional Roll-up Awning You Can Buy! Turn your awning into a spacious private room. Best built low-cost vinyl room on the market. Outperforms all other low cost vinyl rooms. It's a great value in a quality room. Use Carefree SunBlocker & SideBlocker to shade the area under your awning. Don't put up with the heat and glare of early morning or late afternoon sun. The SunBlocker's weather resistant open-weave fabric cuts almost 85% of light to keep you cool and comfortable - but it doesn't block your view! Block the heat before it gets in your rear windows. Beat the heat with a FullView SunShade! Enjoy your awning at night. Best of all, it's bug free! A rugged 32" light fixture. Shatter and water resistant. Designed to provide a minimum of 3000 hours of life. Use with Carport Stakes to keep your awning taut. Easy push-button operation, ideal for class C motorhomes. Carefree of Colorado Travel'r Patio Awning - Now your Travel Trailer or 5th Wheel can have the same ease and convenience as a big motorhome. An awning specifically designed for the truck camper rear entry door. This lightweight room is specifically designed to fit the Carefree 12V Eclipse and Travel'r as well as all brands of traditional patio awnings. Carefree's VentShade blocks out the light! Fits Carefree metric sized Campout and Freedom awnings. Carefree Weekend'r Patio Awning Room - Quick, easy set-up in less than fifteen minutes! Perfect for picnics and relaxation. And when you're ready to hit the road again, it easily fits into a convenient storage bag.